Mr. B and I dream of a kitchen remodel but we have a very small space to work with. Yesterday I told him that I wanted a fridge that fits in the corner and he blahblahblahed about "you won't be able to open it" and "you lose all your counter space" and yaddayaddayadda. I can't seem to find a company in the USA that sells this kind of marvelous thing. Is it a size thing? Do they think all USAians have huge kitchens and that we couldn't fall in love with something so well designed and practical? Should I become an importer of these? Do any of my overseas friends have any experience with this divine contraption? If it breaks down do you have to demolish your entire kitchen? [+3] - edgarblythe - 12/02/2014They offer only the products that sell well. If they expect to sell twenty in a year, versus a thousand of the other kind, well, you know what I mean. No corner refrigerators, more than likely. They offer only the products that sell well. If they expect to sell twenty in a year, versus a thousand of the other kind, well, you know what I mean. No corner refrigerators, more than likely. I just literally scratched my head on this one. Even though I can view your image boomer, I can't see what you mean by a corner refrigerator. What would be the purpose, and why would it be useful? I googled images for corner refrigerators and came up with some examples, but I guess I can't visualize it well. I'm not good with spatial stuff. What would be the reason for one, and the advantages? Why would it work better for a smaller space? Wouldn't what Mr B said is true, that it would take up counter space? Our kitchen is tiny and wall space is at a premium. We can't expand the kitchen because it's in the middle of the house. We're trying to find a way to fit a full sized fridge in there and the only solution we can come up with is a fridge with sliding doors, like you might find in a restaurant kitchen, and most of those are huge. Putting a regular fridge in the corner means you waste the area where the walls meet. 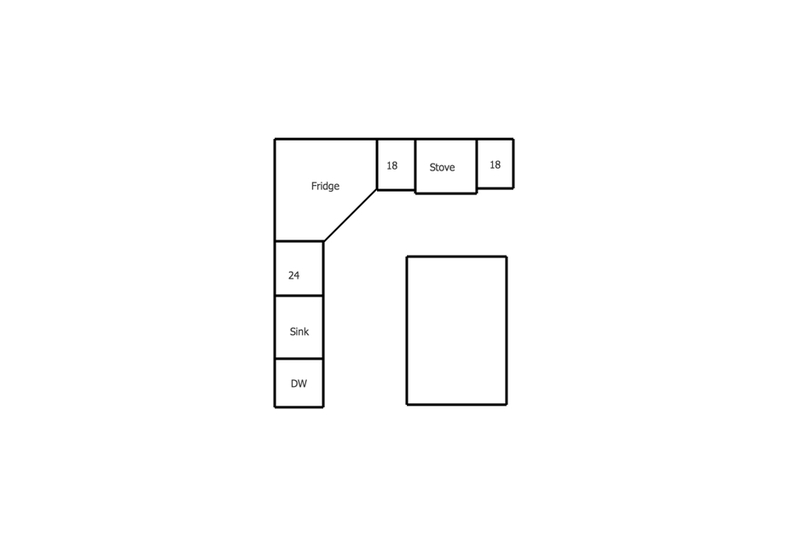 A corner fridge is pentagon shaped so you still get that space. We can add counter space by knocking down the wall between the kitchen and dining room and adding an island but there still isn't room for a fridge. Yeah, I have part of my counter space that's under cabinets and forms a corner. It's not a space I would utilize while cooking, as it reaches too far back. I have a square basket I keep there that's kinda a bread basket, tortilla chip storage etc. Yes, if the kitchen were smaller that "wasted" space would be utilized better by having refrigerator space in there. I think that fridge is customized. If you want one of those might as well search in google for companies that creates custom fridge though money wise it will be very costly. Before buying a fridge from Doncaster make sure it's compatible with the electrical system in America. Even our plugs are different, to include an earth. I am surprised that if such a marvel existed, it is not available here --- as you look at places like Boston, NY, San Fran....space is at a premium and there are many small kitchens. I've seen them and lived in them. wonder if there is more to it than just the space - maybe they are not that functional??? Yeah linkat, I was thinking the same thing re living in cities in a very small space. This might be because I'm just not used to seeing fridges shaped that way, but I keep looking at the relatively narrow opening, and the wide back, and wonder how easy it is to get back there. I'm Switzerland on this though. 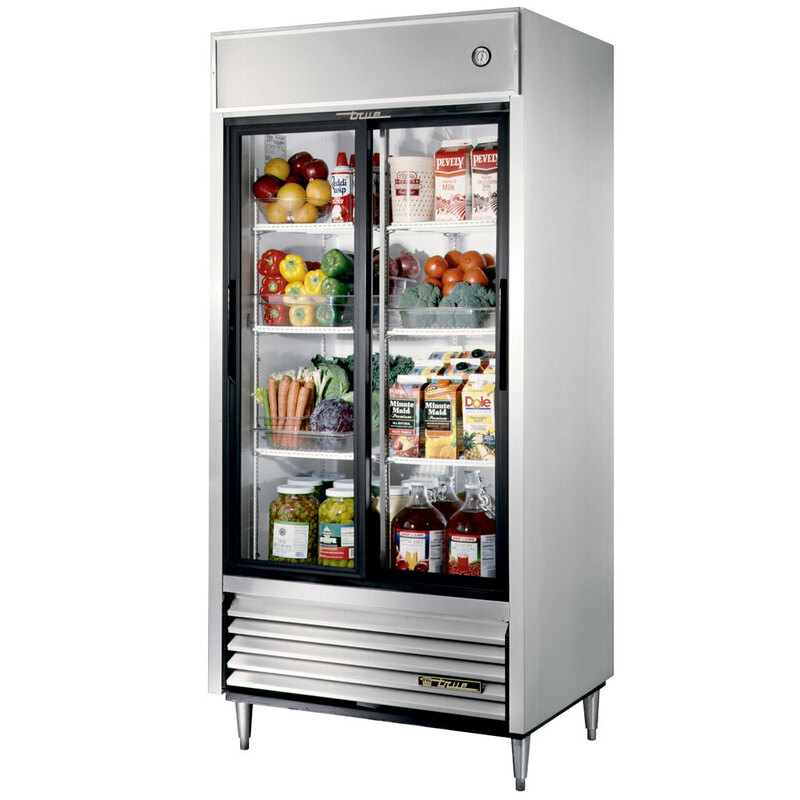 Here is a great article from consumer reports on fridges for small kitchens. and here is a solution to put a fridge in the corner. yes, I was looking at images where the appliance was simply set into the corner, and encased, like your example. It would seem that if you did this, you could make doors on either side for storage of very seldom used items, keeping the other cabinets available for everyday items. I just don't know though. Up in the air. This definately takes care of that awkward corner storage space. The fridge in that schematic better never need to be replaced or removed for maintenance. Yer swayin' me roger, yer swayin' me. My biggest concern would be that you'd have to rip your kitchen apart if it ever need to be serviced. We could kind of circumvent that problem in our house because the basement staircase runs behind the wall where it would be placed. 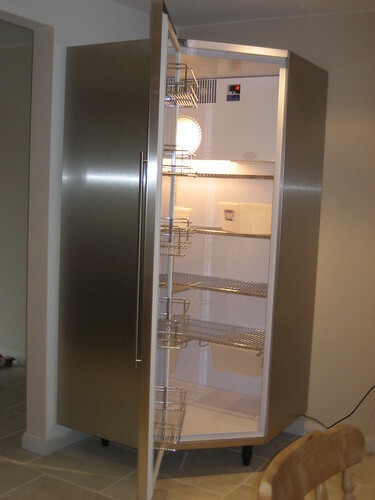 We could easily put in a removable panel that would allow access to the back of the fridge. Also, it looks like it might be hard to clean. We need a big fridge though. I cook a lot. Right now we have a fridge on a kind of back porch area and another in the garage and they're both usually pretty full. I would love to have one big fridge in the kitchen. It certainly looks easier to clean and to service but I don't like the idea near as well as I like a corner fridge idea. I'm really surprised that they're so hard to find here. You would think that a short one that fit under the counter but still offered so much storage would be perfect for smaller kitchens. I'm the one that doesn't even like open floor plans with the kitchen in plan view of all the house. Now you expect me (and anyone else) to have to look at the inside of my refrigerator too? I think I would prefer one with included freezer compartment. Maybe that's just what I'm used to. Looking cool quotient diminishes exponentially when factoring in repair costs.